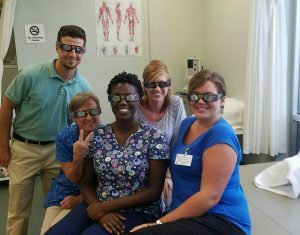 Our Optim Healthcare – Screven clinic in Sylvania, GA is celebrating the upcoming solar eclipse on August 21st. The local library donated glasses and they are having a “Swingbed Social” to celebrate and experience the solar eclipse. Patients will invite friends and family to join. Staff involved are Brook Marchand, Meryl Cato, Eric Shepherd, Faith Wiles and Cindy Roth.